Case in point; I recently purchased the four API 512c pictured above and used them for tracking drums. The APIs were used on kick, snare top, and overheads to get their coloration on the whole kit. The snare bottom and toms were also mic’ed, but with other preamps. Without any EQ or compression, the tone of the kit was right there. For previous sessions, I had used the preamps on my Apogee Ensemble and was never able to get the sound I was looking for. Don’t get me wrong, the Ensemble preamps are really good, but they aren’t APIs. On the same session, I also tracked electric guitar with the APIs. I frequently use a pair of BLUE The Ball mics, but on a whim I set up a pair of venerable Shure SM57s. I was surprised with the results - I actually preferred the sound of the 57s! The end result was some great sounding guitar tracks that worked extremely well with the drums. 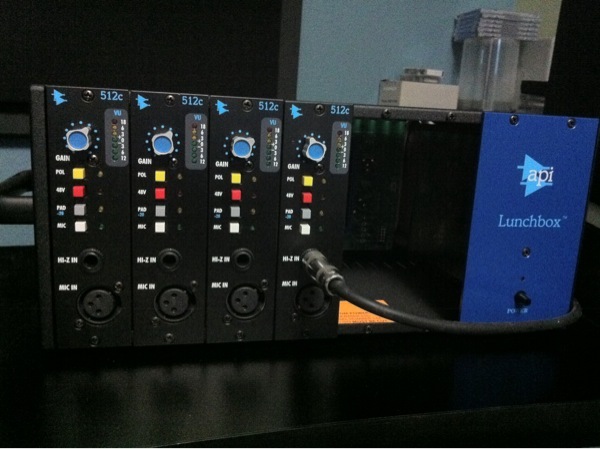 API isn’t the only company making great sounding mic preamps in the $500 to $1,500 price range. I can almost guarantee that whichever one you purchase will sound significantly better than your soundcard’s built-in preamps. But don’t take my word on it, listen for yourself and find what you like. Now, what to install in those two remaining slots?